The Spicy Summer Sundays Blog Tour wraps up today with a phenomenal finale at Danielle’s! He’s wrapping things up in a fine and delicious style, so make sure you go partake! I have really enjoyed this delightful tour, and hope you have to! The deadline is August 31st – so there’s still plenty of time to craft your own kiss! It was his hands that kept my eyes sliding back across the bar. I knew those hands. And they knew me. Trina’s was the neighborhood nightspot. You know, the one where everyone goes after work to wind down, ordering micro-brews, Manhattans, Martinis and Mojitos. Not a meat market like those over along Main Street. The man in the corner was not from the neighborhood. He nursed a tumbler of whisky, the golden liquid luminous and shifting as he swirled it. Broad shoulders filled the black button up dress shirt, sleeves rolled up to reveal a riot of color etched into his skin. Every so often his eyes swept the dim bar as he lifted the glass to his lips. Each time his tongue collected the lingering drops. His mouth curved when his brittle gaze snagged mine. “Tee…Tina, you’re staring!” I jerked, blinking in confusion at my friend. Nancy touched my arm, lips thinned in concern. “I’m fine, I’m fine.” I waved at Frank and held up my glass. His brows jumped in surprise, I never had more than one, but he tipped the bottle of expensive tequila over it regardless. The smooth, slick alcohol burned down my throat. “What’s wrong with you tonight,” Nancy hissed. I shook my head, eyes straying back across the bar. His lips twitched and he lifted his whisky in greeting before tossing back the last swallow. Arousal slithered down my spine and coiled, dangerous and dark, in the cradle of my pelvis. “Tina, you don’t want to go there.” Her warning registered in my brain, but my body wasn’t interested. He stood, holding me captive from across the bar. Nancy’s ineffective pleading hummed on the other side of my heartbeat. My breath quickened as he wove through the tables, a lethal tiger amidst the collected house cats. Frozen, I waited, prey caught in his hypnotic gaze. He stopped, held out his hand. When I reached to take it his fingers wrapped my wrist instead and he tugged me against him. My hands flattened against his chest. “I’m going to kiss you.” His rough voice stroked down my spine. “I don’t like whisky.” Some part of my brain had always thought that was important. He chuckled, low and deep, and cupped my jaw. His thumb dragged across my lower lip, callus snagging and releasing the delicate creases. I trembled. The anticipation rolled out from my epicenter, silencing the bar. Fingertips pressed into my nape, each imprinting my skin with his touch. My mind locked on details; lush eyelashes, the corona of blue about his pupils, a tiny hooked scar at his temple, the dark smudge of day-old stubble. He leaned in, holding my gaze, his breath teasing my lips open. I could taste peat, apple, and vanilla in that infinite stretch of time. “Don’t.” It was, we both knew, an empty attempt at resistance. His tongue teased inside my lips. As often as he’d kissed me my body still jolted in reaction. My knees threatened to fail and my hands crept up his chest and over his shoulders. When he pressed his mouth to mine I moaned. Someone close gasped. I couldn’t help the shiver that traced my spine, following his fingers. He reduced me to my basest form, nerves controlling my limbs autonomous from my brain, wrapping around him, mouth opening to feed him moans and whimpers. The little voice that kept me in line screamed, voiceless, gagged by the play of his tongue against mine, the pressure of his lips stealing my ability to form words. Each tug, pull, push, sweep and tease urged me closer, working my limbs on invisible strings, a helpless marionette. The kiss shattered shards of my protective psyche into the farthest, darkest corners of mind. There was no escaping him in the silence of that crowded room. It was a kiss that should have happened at the altar, not in a bar. He pulled back. His cold blue eyes sparked. Anger burned behind them. “Outside. Now.” The growled words made me shudder. My legs almost buckled beneath me when he let go and stalked from the bar. Nancy steadied me. I shivered and my eyes tracked back to the front of the bar. Beyond the dark glass a flame sparked to life and left a glowing ember hanging, a dark orange star that pulsed with his inhales. I left her, sputtering and stunned, and made my way towards the door. I’d run long enough. It was time to pay the piper. I’m lost to the music today. strings under an artist’s fingers. I could float away with the melody. to let off the pressure. 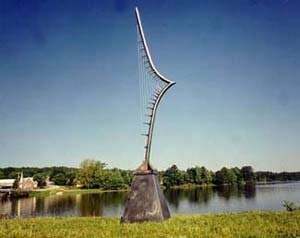 a wind harp to be played on the mountain side. Alison Tyler asked for stories of favorite quickies, and when AT asks for things, I try to deliver. The in-laws arrived before I got home from work. I simmered, a teapot about to scream. On my knees, my mouth full, surrendering to his hands as he fucked my mouth, shivering with my power that made his knees tremble. Actually, he’s probably salty, spicy, and a touch inebriated at this point, but regardless, take yourself over to his place for a luscious discussion of salty things to wrap your lips around! And make sure you check back for the grand finale next weekend! No, I don’t know where it’s going to be yet…it’s like those super secret parties in high school…you know, where someone told someone who told you where you were supposed to show up? Well, hopefully someone will tell me where I can tell you to go! damn. thank came out wrong. You knew what I meant, right?